my second skin for 'My Surrender'. Excelent job! 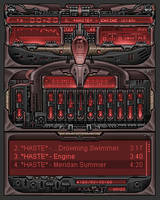 I like especially the "3d" part of engine! 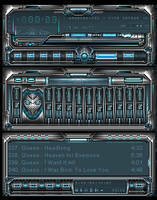 you know I saw that skin some time ago, but I didn't feel like downloading it ...after my hard drive format I had a default skin, I came to your site and downloaded it, now I'm using it, you know it came to me that when there are hundreds of thousands of Winamp 2 skins and everything was done in this subject I realized that this skin breaks all these rules, it's hell of an original design gotta tell you, I love these techy elements which flow nicely with aqua feeling background. I'll tell you, when I first saw this skin, I was a little skeptical..but the instant I saw the full view and downloaded it, I fell in love. 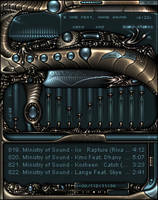 It's one of the coolest nontraditional winamp skins I've seen to date, incredibly styled, and purely beautiful. So I'll be ing this and adding it to my collection. Great work, man. 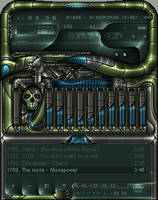 This skin looks a little different, both from your style and regular winamp skinning in a whole I think. Although thats a good thing... Its not really my style to use. But I still like it! 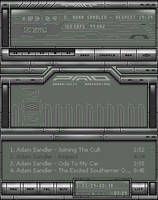 And as $dj-designs said, it has a nice mix of flat areas and interface! Swore I had you on dev watch before, I got you added now though. 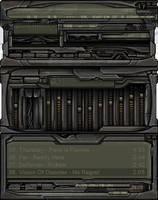 Im not really a fan of picture skins but this is the best Ive seen yet, probably since you added in some nice stuff like the metal. 'tis very different though. wow...very different! i like it! good work! Great work C-Specter! 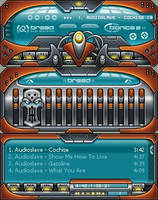 I'm so glad that you still make skins to Winamp2! This one looks pretty unique to me. Keep up the good work, dude! cool one maan! i like that skin alot, cuz it's very different to your other skins and of course well made again! only thing annoying me the heavy cutten edges, I like smooth edges but it works well on this skin of course! Nice. It really has a distinctive style to it. still very very good job! Very impressive work. If you hadn't said that it was a picture, I would never have known. You've integrated the image very well. 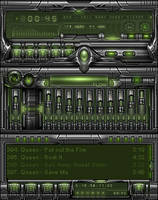 heh...the coolest picture skin i've seen...very original indeed...great work as always man. if only all the picture-skin reached that quality ! I dont think I've seen any skins with this style before and I really like it. The colors are really soothing and fit well with the metal. Not a big fan of the winshade mode, but I dont use it anyways. Excellent. Wow. 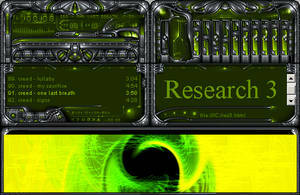 I would like to see more of a titlebar in the main window, but other than my wants, I think it came out great. You should be very proud of this. That is a very smooth, attractive and unusual skin. I love the contrast between the 'art' and the lumps, very nice work fitting that together. I sort of agree with comments about how the interface could be more metallic with a higher contrast, and how the text in the header looks a bit out of place (maybe if it was lower case, or more spaced out), but overall I really like the skin. It's a shame I've never heard of the band! very interesting.. original no doubt. 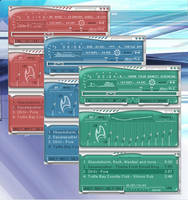 Interesting, I like the mixture of interface and flat areas. cool! i really like the display... but i would like to see the metal a little bit sharpen good job c-specter! matches my desktop almost perfectly. thanks. as all your other skins perfectly done! great work as always. i really love the colour mixture, looks really nice, and the plastic looking metal thingy. goes traight to my favs. This is a pretty sweet skin. I like the shapes and stuff since it's still easy to use and you don't have to guess at buttons. Really great job on this.